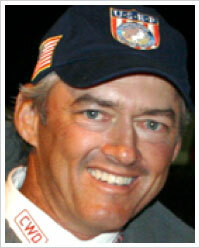 Will Simpson is a Grand Prix celebrity, riding at the top of the sport for many years. His Gold Medal winning round on Carlsson Vom Dach in the 2008 Beijing Olympics is the crowning achievement of his career - thus far! Will's enthusiasm for the sport spills over into his Guest Coach segments, where his charisma and charm make for a dynamic learning experience. Q: What got you riding and when? A: 11 years old, I tried every sport under the sun. Q: Where did your equestrian education begin? A: Sangamon Valley Pony Club in Springfield, Illinois. A: Glenda Jo, a 15.3 hand thoroughbred mare. She won 8 out of 8 classes at two different shows. She is why I ride today! Q: What inspired you to become a professional? A: I love the outdoor life and wanted to be a cowboy. Q: Have you tried any other disciplines? A: I like reining horses. Q: Best moment on a horse? A: Jumping the last jump in the Olympic Games clear for the Gold! Q: Who have been your mentors? 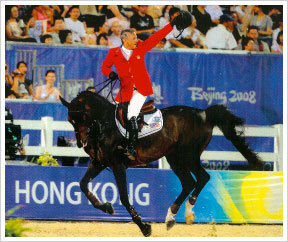 A: George Morris, Rodney Jenkins and Bernie Traurig. Q: Best time or place to ride? A: Out on the trail. Q: Your philosophy as a horseman? A: Try to help the horse understand his job. Q: Do you have any of your own horses? A: I like to own a horse or two at a time. Q: Career aside, non horsey accomplishments or interests? A: Father of two - daughter, Sophie and son, Ty. BBQing the best ribs west of the Mississippi! Now if I could only play the guitar! Q: Charities or causes you care about? Q: Your inspiration to ride and teach? A: The horse, there is always something to learn from the horse. 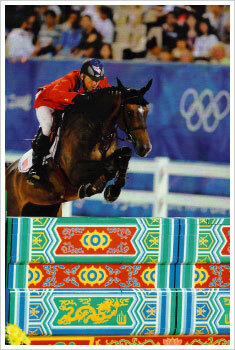 2008 Olympics Show Jumping Team Gold Medal on Carllson Vom Dach. 5 time World Cup Finalist. Winner of over 75 Grand Prixs. Held the World Wall Record 7'9 1/4 for 10 years. Currently holds the North American High Jump Record. Current member of Simpson Show Jumping along with wife Nicki and daughter Sophie. Will Simpson unveils the system he uses every time he jumps a fence to create the distance he wants. If you liked this video and want to learn more about how to find a distance check out Bernie Traurig's three part topic Exercises to Develop a Better Eye. Will Simpson demonstrates the exercises he uses to get acquainted with any new horse that arrives in his barn. With safety in mind, Will starts this process from the ground in order to better assess his new horse before getting in the saddle. Will Simpson discusses the riderʼs position from take off, over the jump, to landing (or recovery). Will defines the key points to mastering body control over fences, all beautifully demonstrated by his wife Nicki Shahinian-Simpson. Get to know Will Simpson from his introduction to the sport, to his biggest influences. In this exciting video youʼll get Willʼs own play by play of his brilliant 2008 Olympic Jump-Off round aboard Carlsson Vom Dach that resulted in Team Gold!